Why Doesn’t Obama Ban Iranian Press TV? You are here: Home / *Articles of the Bound* / Why Doesn’t Obama Ban Iranian Press TV? Authorities in Britain revoked the license of the Iranian regime’s English-language global television channel known as Press TV because of evidence that it is a propaganda outlet controlled by the Iranian regime. But the Obama Administration permits the channel to operate on American soil without a license and in violation of U.S. sanctions regulations, which ban commercial transactions with Iran. It appears to be another example of Obama coddling the terrorist regime. British authorities justified the move by citing the specific example of a Press TV 2009 interview with a Newsweek correspondent held in an Iranian jail. British telecom regulator Ofcom found that the interview by Press TV with Maziar Bahari, who was jailed by the Iranian regime over his reporting of the disputed presidential elections in June 2009, was conducted under duress. It held that Press TV was in violation of its British broadcasting license because its content was dictated by the Islamic Republic of Iran Broadcasting, the state broadcasting authority, and instructed the satellite carrier BSkyB to remove Press TV from its platform. In the United States, the situation is even worse because although it operates openly in Washington, D.C., New York and Los Angeles, and regularly conducts interviews with such figures as Republican Congressman and presidential candidate Ron Paul, it does not have a license from the Treasury Department’s Office of Foreign Assets Control (OFAC). So far, the Obama Administration has done nothing to shut it down. But why do our values permit accommodating the actions of an illegal television entity devoted to propaganda and support for an outlaw regime that the Obama Administration itself says supports international terrorism? In the case at issue in Britain, Bahari was picked up by the Iranian authorities at his parents’ home in Tehran on June 21, 2009, and jailed for four months in Iran. After an international campaign won his release and he returned home four months later that October, Bahari said that his captors had forced him to read a prepared script in front of Press TV cameras, just as American POWs were forced to do in Vietnam. Press TV has scrubbed the interview from its website but it was widely reported at the time. In the script his captors gave him to read, Bahari accused Western reporters of working “as spies,” and “confessed” that he had been covering “illegal demonstrations” as part of a Western effort to promote a “color revolution” in Iran. His family and the media dismissed his “confession” as clearly coerced. Secretary of State Hillary Clinton pushed Iran hard to release Bahari, but never made a statement condemning Press TV for airing the coerced interview. “We’ve been condemning the Iranian government writ large on this, not any specific agency,” a State Department spokesman said. The Obama Administration has continued to allow Press TV to operate unhindered in the United States, despite clear evidence that it is operating as a propaganda arm of the Iranian regime. Indeed, the State Department regularly entertains questions from Press TV reporters, and allows bloggers on its “DipNote” website to plug rabid anti-American and anti-Israel propaganda with links to Press TV articles and interviews. So because it operates illegally in violation of the law, the U.S. will take no action. This might be enough for administration lawyers, but it defies common sense. Press TV is not the only Iranian government media organization operating in the United States. The Islamic Republic of Iran Broadcasting (IRIB) operates Aftab TV, which broadcasts in Persian and operates a prominent website. Last year, IRIB opened yet another 24-hour TV network they billed as “Iran’s CNN,” called Islamic Republic of Iran News Network, IRINN TV. They began broadcasting in the U.S. with an hour-long live program from a new Washington, D.C. studio on April 6, 2011. Their flagship U.S. show is called “Two half-hours (Dow Nim Saat) that airs from 11 a.m. to noon everyday. While most programs are in Persian, IRINN also broadcasts news in English via satellite to the U.S. The regime has also lavished money on the print media as a means of maintaining an intimidating presence within the Iranian-American community. The U.S. edition of the Tehran daily, Etelaat, was printed in New York and flown via Federal Express to a dozen distribution points around the country for over two decades, until it was shut down last year after an undercover FBI investigation determined it was being funded illegally out of the Iranian Permanent Mission to the United Nations, a source involved in the investigation told me. With the exception of Etelaat, the Obama Administration has continued to allow Iranian government media organizations to operate freely in the United States, mostly without licenses, despite nearly two decades of Iran sanctions that prohibit commercial exchanges between the U.S. and Iran. In a series of email and telephone exchanges, officials at the Department of the Treasury refused to acknowledge whether the administration or its predecessors had granted Press TV a license to operate in the United States. “We are unable to comment publicly on organizations that may or may not have received licenses from OFAC. However, we note that as an official propaganda arm of the Iranian government, Press TV has a history of fabricating news and has faced lawsuits in the UK for airing forced confessions,” a Treasury Department official said. Treasury’s Office of Foreign Assets Controls issues trade sanctions guidelines and maintains the list of “Specially Designated Nationals” (SDNs) banned from doing business with U.S. persons. In the case where an organization subject to U.S. sanctions continues to operate in the United States by moving money under the radar, OFAC has often acted quickly and without warning to shut them down. But not in this case. Press TV spews out unending streams of anti-American propaganda in a full-service program mix that includes talk shows, news reports, and TV magazines, aimed at an American audience via satellite. Professionally-produced—often times by Americans—these shows trot out a congeries of conspiracy theorists, Holocaust deniers and their apologists, masquerading as “analysts” and “political commentators” to give them a veneer of respectability. In this case, Press TV appears to be emulating the old Soviet Union, which specialized in propaganda for the regime and against its enemies. The Soviet-led Comintern sent propaganda specialist Willi Muenzenberg to America to recruit propaganda agents. Muenzenberg wrote the playbook that was later used by Press TV and much of the “politically-correct” left in the 1920s and 1930s, when he set up a vast web of cover influence operators stretching from media to academia to America’s newsrooms that continue to make their message felt way beyond the grave. The propaganda from Occupy Wall Street appears to be a modern-day example of the Muenzenberg approach. Press TV takes the anti-American propaganda to a global level. Like the old Soviet propaganda networks, Press TV uses Americans to make the case against their own government and society. Consider the case of James Fetzer, “a prominent philosopher” who went on Press TV to comment on the violent turn of the Occupy movement in Oakland last November. He blamed the police. A professor at the University of Minnesota-Duluth, Fetzer said, “We are seeing the increase in militarization of the police forces throughout the United States and that is a very bad tendency that has been taking place since 9/11. We see the rich getting richer and the increasing gap between the rich and the poor. This gap has been widening since the administration of Ronald Reagan,” Fetzer said. As it turns out, James H. Fetzer is indeed well-known—as a conspiracy theorist. In a Wikipedia entry tagged by editors as “an autobiography,” Fetzer is described as “a well-known conspiracy theorist,” who has written extensively on the JFK assassination, 9/11, and the plane crash that killed U.S. Senator Paul Wellstone. Fetzer claims, for example, that the film footage taken of the aircraft that crashed into the World Trade Center towers on 9/11 was “video fakery” caused by “holographic projects,” because the high-speed crash was “in violation of Newton’s laws” of physics. 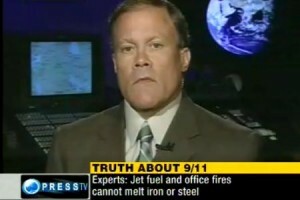 His own website highlights his book, The 9/11 Conspiracy: The Scamming of America. A YouTube video shows Fetzer arguing that Senator Wellstone was assassinated, not killed by accident in a plane crash. After a federal judge in District Court in New York issued a finding last December that Iran “shared responsibility with al Qaeda” for the 9/11 attacks, Press TV naturally turned to Fetzer for comment. Calling the ruling “preposterous,” he said he knew who was responsible for the attacks: Israel’s intelligence agency, the Mossad. Another propagandist used by Press TV as an on-air commentator is Mark Dankof, whose support for the Ron Paul presidential campaign we highlighted in an earlier story. In a May 2011 article aimed at discrediting the Ofcom case against Press TV in Britain, Dankof hauled out the big artillery. Why was the British government attempting to shut down Press TV? It was, of course, all because of the Jews. “It may not be a coincidence that the British Ofcom case against Press TV Iran pops up against the backdrop of Netanyahu’s state visit to the United States to press his own case for ongoing Talmudic Death and Destruction in the Middle East,” Dankof wrote. The “logic” of his case went like this: Press TV accuser Maziar Bahari was a contributor to Newsweek, whose late chairman, Sidney Harman, was married to Rep. Jane Harman of California, a Jewish Democrat. “Mrs. Harman, in turn…proves to be the very member of Congress wiretapped by the American National Security Agency (NSA) conveying promises to Israeli agents that the dogs would be called off from tailing and successfully prosecuting the espionage case involving key executives of the American Israel Public Affairs Committee (AIPAC),” Dankof wrote. The Protocols was a Russian forgery designed to blame the Jews for the world’s problems. Muslim religious leaders and political leaders have touted its “accuracy” to me in interviews throughout the Middle East for decades. More material of this sort can be found in the innumerable interviews Press TV conducts with “expert” Paul Sheldon Foote, whose favorite line is that “Crypto-Jews” have initiated a war between Christians and Muslims. Such arguments harken back to the ugliest forms of Western anti-Semitism. When Press TV CEO Mohammad Sarafraz announced the creation of the new English-language satellite broadcasting channel in June 2007, he stated at the get-go that the goal was to spread the propaganda payload of the Tehran regime. “Since September 11, Western bias has divided the media into two camps: those that favor their policies make up one group and the rest of the media are attached to radical Islamic groups like Al-Qaeda. We want to show that there is a different view. Iran, and the Shi’ites in particular, have become a focal point of world propaganda. From the media point of view, we are trying to give a second eye to Western audiences,” Sarafraz said. While Press TV made some effort in its U.S. programming to invite guests who weren’t always fans of the Iranian regime, all pretense of its propaganda aims disappeared in May 2009, just before the stolen elections that gave Iranian president Mahmoud Ahmadinejad a second term in office. That was when a group of Ahmadinejad supporters raided the petty cash desk at Press TV’s Tehran headquarters and used the money to support Ahmadinejad’s election campaign, according to Press TV insiders who subsequently left or were forced to leave the network. Since the June 2009 elections, opposition politicians, such as Mir Hossein and other challengers to Ahmadinejad, have been banned from the airwaves and Press TV has abandoned any pretense of even-handedness. Press TV has used a number of subterfuges to skirt the U.S. sanctions on commercial transactions with Iran. From the start, Press TV has maintained close ties to the Iranian Mission to the United Nations, the Iranian regime’s only legal financial base in the United States. The UN mission may have paid some staff in cash brought in through the diplomatic bag. Press TV maintained an official presence at the Iranian Mission. Because it could not incorporate directly in the United States, Press TV worked through production companies operating in the U.S., which in turn hired crew, correspondents, and producers. Former Atlantic Television News (ATN) correspondent Colin Campbell questioned U.S. officials on Press TV’s behalf. ATN Productions Ltd. has seven reporters currently registered with the Senate Press Gallery: Nicholas Ewing, Affra Khallash, Taleb Khallash, Zina Khallash, Dirik Rice, Mohamed Said Ouafi, and Firas Tuma. The company is registered in Denmark and produces the weekly magazine show “American Dream,” hosted by an American, Nisa Islam. ATN operates out of production studios located on K Street in downtown Washington, D.C. AIM Center for Investigative Journalism director Cliff Kincaid was invited and appeared on its “American Dream” program a couple of times, before realizing that ATN was operating as a front for the Iranians. When he criticized the Iranian regime on one of the programs, he was not invited back. Press TV contacted Accuracy in Media on another occasion, looking for a guest for one of its programs to discuss why Republican Representative and presidential candidate Ron Paul was not getting more favorable attention from the U.S. media. Paul has pleased the Iranian regime by defending its pursuit of nuclear weapons. AIM declined the invitation but considered the request as more evidence of how foreign propaganda channels, such as Press TV and Russia Today, have embraced the foreign policy views of the Texas congressman. Press TV also contracts with American Press and TV Services (APTVS), an outfit run by Egyptian nationals Gamal Hassanein and Samir Ezeldin. Like ATN, they hire producers and camera crews to film events and conduct interviews at Press TV’s request. “Gamal and Sam were running the operation, because Press TV was not allowed to incorporate here,” a former Press TV insider told me. APTVS took over Press TV’s bureau at the United Nations in 2010. Like ATN, their correspondents and camera crews have all received press passes for the U.S. Capitol complex from the Senate Press Gallery. They hired Colin Campbell away from ATN, and have also registered the following staff with the Senate Press Gallery: Ibrahim Alshamrani, Moaz Attawia, Fahd Banhawy, Umut Colak, Samir Ezeldin, and Mike Kellerman. The Senate press passes not only give the Press TV contractors access to the House and Senate chambers, but serve as accreditation for a much wider range of events reserved for members of the press corps, including White House, State Department, and Defense Department briefings. Although each of these three issues its own credentials to beat reporters (the “White House press corps,” etc. ), the Senate press pass gets most reporters through the door for the occasional event. Although APTVS and ATN are not part of Press TV, they produce “works for hire” for Press TV. Should OFAC decide to enforce the law, this could be construed to mean that they are engaging in unlicensed commercial transactions with Iran. In an effort to forestall precisely such an investigation, APTVS for several years received payment from Press TV through a Palestinian production company in Ramallah run by silent partner Maher Shalabi, according to former Press TV insiders. On his Facebook page, Shalabi identifies himself as General Manager of that company, PMCC TV. “Press TV used to contract Maher, and he then contracted with APTVS in Washington,” a former insider said. “APTVS then booked the guests and studios and conducted the interviews or satellite link-ups.” Shalabi also works for “Palestine TV,” and conducted a high-profile interview with Secretary of State Hillary Clinton for that channel in 2010. Do the activities of Press TV and these production companies fall within the “information” loop-hole of the Iran sanctions? Yet, the Obama Administration permits the channel to continue to operate in violation of the law. Congress should investigate. Kenneth R. Timmerman is the New York Times best-selling author of Countdown to Crisis: the Coming Nuclear Showdown with Iran (Crown Forum, 2005), among other works. His books and articles can be found at kentimmerman.com. PTV & RT are very likely both controlled opposition, designed to occupy the realm of available foreign news and aid the other false “anti-zionist” patriots on the pedestal. If the US can raid networks & arrest website operators in their own country and abroad for piracy, they can surely put a stop to public infiltration of propaganda networks if they so chose. The freedom of press talk is absolute nonsense. Congress had no legitimate motive to investigate because PTV & RT are both aligned with the greater goals of the west. The UK pulled PTV from Sky to appear as if they were concerned – any UK citizen could easily view the network’s reporting on YouTube. THATS HIS NO.1 SHOW, P.S. SOON ”WE THE PEOPLE” WILL WATCH IT AS THAT WILL BE THE ONLY SHOW ON T.V.